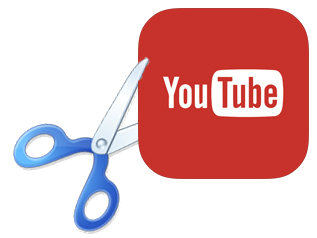 Learn how to trim YouTube videos free with online YouTube video trimmers or desktop YouTube video cutter. "Is there a way to download only a part of a YouTube video without having to download the whole video to trim locally?" "I would like to trim a YouTube video say from 5 minute to 10 minute and download it into my desktop computer. Any easy solution?" "How to cut a specific portion of a YouTube video and embed it into WordPress?" Watch YouTube videos online and find a very funny part intending to share with friends or embed into blog? Regret the uploaded YouTube videos have some unnecessary/unsatisfied parts and want to cut them off? Record a masterpiece video having some fluffs and eager to remove unwanted content at the beginning, end or middle? Helpful solutions are provided in this post. -	Edit video: Cut, split, crop, rotate, flip, merge video. Add effects/watermark/subtitles to video. Adjust V/A settings. -	Convert video: Convert almost any video to MP4, FLV, AVI, WMV, MOV, H.264, HEVC, iPhone (X), iPad, Android, etc. -	Record video: Capture screen video with audio. Freely select video recording area. Record video with webcam. -	Download video: Free download 8K/4K/1080p/720p videos, moves, MP3 songs from YouTube and 300+ sites. -	Convert DVD: Convert any home-made or commercial DVD to MP4, AVI, WMV, MOV, H.264, HEVC, MKV, iPhone (X), etc. These online YouTube video cutters may allow you to easily trim YouTube videos online in two steps: Enter a YouTube URL and select the interesting section of the YouTube video to crop (>> See how to crop a YouTube video). After that, you can download the cut video to computer or upload to YouTube. You may be asked to enter an email address to be able to use the service and save the trimmed video and may receive spam. You may also download the trimmed video with ads, malware or virus harmful to computer. What's worse, these free YouTube video cutters online are easily stuck or down and can't work at all. A popular way to trim YouTube video for free is to use YouTube own video editing tool, YouTube Video Editor. All your YouTube uploads will be added automatically to the Video Editor. You can use this tool to cut the length of your video clips, combine multiple videos, and add music or effects. Step 1: Log into your YouTube account and click "Upload" icon. Step 2: Select the video from computer and upload it to YouTube. 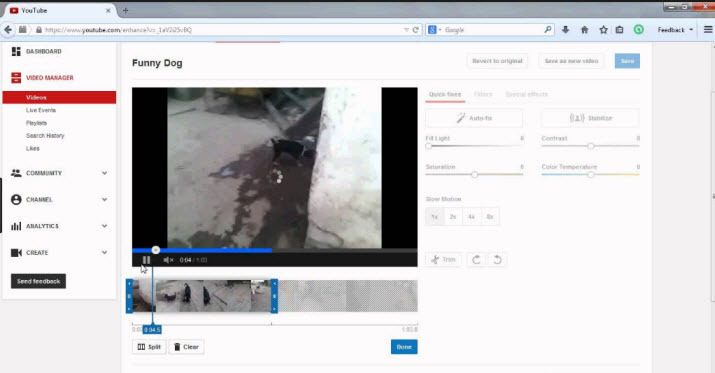 Step 3: Click "Video Manager" before publishing the video onto YouTube. Step 4: Locate the YouTube video you'd like to trim and click "Edit" button. Step 5: Click "Enhancement" and click "Trim" button. Then cut the unwanted part of the video and save it. 1)	The Video Editor tool at "http://www.youtube.com/editor" now doesn't support publishing videos that are longer than one hour. 2)	It's complicated because you need to register an account on YouTube and upload the video to YouTube to trim it. 3)	Its video editing functions are limited. 4)	The trimming process isn't always smooth. * Free download any YouTube video/movie at superfast speed. Other 300+ video download sites supported. * Trim funny YouTube video clips to share with friends. Trim & edit videos for later YouTube uploading. 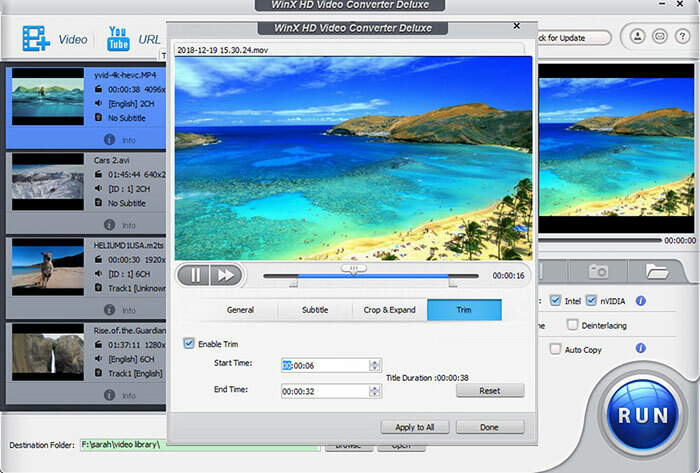 * Convert almost any video like MKV, HEVC/H.265, M2TS, AVCHD, AVI, WMV, MP4, MOV, MPEG, FLV, and more from one format to another at fastest speed with Intel QSV, Nvidia CUDA/NVENC, AMD hardware acceleration supported. * Convert DVD to digital. Record computer screen with freely cropped area. Record webacm on PC/Mac. At first, free download and install this stellar clean YouTube video trimmer & editor - VideoProc - on Windows 10/8/7, etc. and follow the detailed guide below to trim YouTube videos to share with friends, embed into blog/email or later upload to YouTube/Facebook, etc. Run VideoProc and click "Downloader" -> "Add Video" button. Find and play the video on YouTube. Copy and paste the YouTube video URL to the address bar of the software, and click "Analyze". Choose preferred video format/resolution from the list and click "OK". Hit "Download Now " to download the YouTube video to computer in a flash. Tips: You can use this way to free download any 2019 popular Hollywood/Bollywood movies or any other videos from YouTube, Dailymotion, Vimeo and 300+ sites. Open VideoProc main UI again and click "Video" button. Click "+Video" icon to load the downloaded YouTube video you'd like to trim a part from. Select output format. You can keep the output format original or change to other desired formats like MP4. Click "ToolBox" and double click "Trim" option. Now you can freely set Start Time and End Time or directly drag the slide bar to trim a part of YouTube video. Hit "RUN" and rightly save the trimmed YouTube video clip to computer. Split Video - Two Easy Ways to Split Video in MP4, MKV, AVI, MOV, etc. Use the all-in-one video software VideoProc (100% clean and safe) to download YouTube (other 300+ sites) videos for free, edit/cut/crop/merge/rotate video, convert any video to desired format, convert DVD to MP4 or any other format, record screen/webcam, etc. with no hassle. Video processing speed is ultrafast. How to Solve 'YouTube Videos Won't Load/Play' Problem?